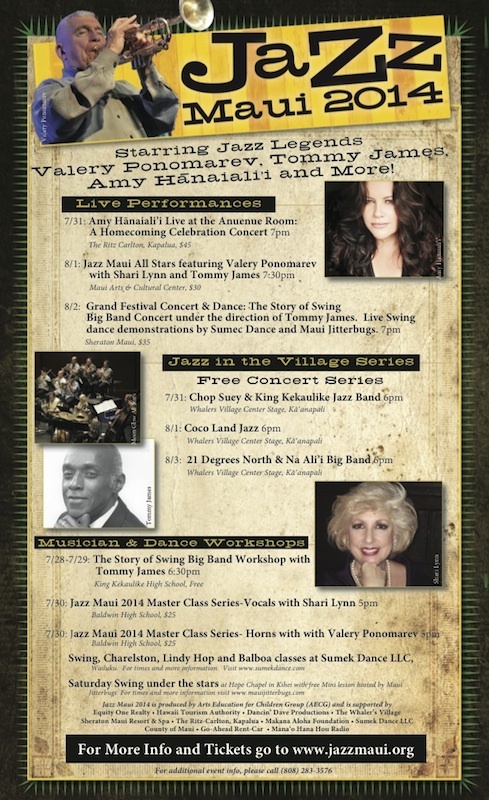 Jazz Legends Valery Ponomarev, Tommy James and Five-Time Grammy® Nominated Vocalist Amy Hānaiali’i Headlined Jazz Maui 2014! Presented by the non-profit Arts Education for Children Group, Jazz Maui took place from July 28th through August 3rd and featured live performances by Tommy James of the Duke Ellington Orchestra, legendary NYC trumpet player Valery Ponomarev, Maui’s own five-time Grammy® nominated vocalist Amy Hānaiali’i and many more. Festival performances offer a rare match up of on and off island talent performing with guest artists, backed by ensembles of local and visiting jazz musicians. Performances took place at multiple island venues including the Maui Arts & Cultural Center; The Ritz-Carlton, Kapalua; the Sheraton Maui Resort and Spa and King Kekaulike High School. A series of free jazz performances also took place at the Whalers Village Courtyard in Kāʻanapali. Jazz Maui 2014 also included workshops for musicians of all levels, taught by guest artists. Workshop highlights included a Big Band Swing workshop with Tommy James, a horn workshop with Valery Ponomarev, and a vocal workshop with renowned Honolulu vocalist Shari Lynn. Jazz Maui is produced by Arts Education for Children Group (AECG), a nonprofit organization, to provide music students on Maui an opportunity to participate in instructional workshops and jam sessions conducted by internationally acclaimed jazz musicians and music educators. With this goal, Jazz Maui develops signature events featuring high quality jazz and various music performances for the enjoyment and enrichment of Maui visitors and residents. Ticket prices and event locations vary. See the past schedule for more detailed information. These events sold out fast! “Jazz Maui 2014 provides an opportunity for local residents, music students, aspiring young musicians, professional musicians, and jazz music aficionados to participate in and/or attend high quality jazz music performance concerts on Maui. We provide a venue for young aspiring local jazz musicians to establish connections within the professional jazz music scene that may facilitate career opportunities,” states Jazz Maui Founder, Bryant Neal. Jazz Maui would not be possible without the generous support of Equity One Realty, the County of Maui, the Hawaii Tourism Authority, Dancin’ Dave Productions, The Ritz-Carlton, Kapalua, the Sheraton Maui Resort & Spa, The Whaler’s Village, Makana Aloha Foundation, Sumek Dance, LLC, and Mana’o Hana Hou Radio.